Robert Torchia, “Georgia O'Keeffe/Line and Curve/1927,” American Paintings, 1900–1945, NGA Online Editions, https://purl.org/nga/collection/artobject/70182 (accessed April 24, 2019). Executed in 1927, Line and Curve is the last in a group of four highly abstract, predominantly white, narrow vertical compositions whose imagery can be traced in part to Georgia O’Keeffe’s interest in Manhattan’s modern architecture. As its title indicates, Line and Curve consists of a simple juxtaposition of a vertical line running down the center of the canvas intersected by a sweeping curve that extends through the upper right quadrant of the composition. The painting verges on pure abstraction while combining architectonic elements with hints of more natural, curving, organic forms. The mottled, gently undulating, white paint surface with evanescent violet hues and the shading of the vertical line suggest the shallow spatial recessions of New York’s crowded spaces. The gray-white palette evokes a cloudy sky. Helen Bullitt Lowry and William Carter Halbert, “The New Architecture and the Old,” New York Times, May 4, 1924. Her new home inspired O’Keeffe to paint a number of New York views ranging from the East River as seen from her window to specific skyscrapers in her midtown Manhattan neighborhood. While some of these urban paintings are more clearly representational, such as The Shelton with Sunspots [fig. 1] [fig. 1] Georgia O'Keeffe, The Shelton with Sunspots, N.Y., 1926, oil on canvas, The Art Institute of Chicago, Gift of Leigh B. Block 1985.206. Image no. 00000080-01, www.artic.edu. © 2016 Georgia O'Keeffe Museum / Artists Rights Society (ARS), New York, others more closely approach pure abstraction, for example City Night [fig. 2] [fig. 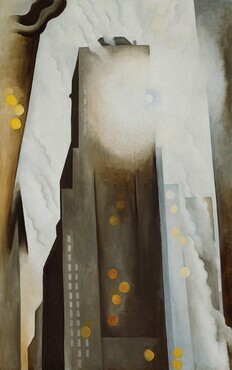 2] Georgia O'Keeffe, City Night, 1926, oil on canvas, Minneapolis Insitute of Arts, Gift of Funds from the Regis Corporation, Mr. and Mrs. W. John Driscoll, the Beim Foundation, the Larsen Fund, and by Public Subscription. © Georgia O'Keeffe Museum / Artists Rights Society (ARS), New York. Executed in 1927, Line and Curve consists of a simple juxtaposition of a vertical line than runs down the center of the canvas intersected by a sweeping curve that extends through the upper right quadrant of the composition. The painting combines architectonic elements with hints of more natural, curving, organic forms. The mottled, gently undulating, white paint surface with evanescent violet hues and the shading of the vertical line suggest the shallow spatial recessions of New York’s crowded spaces. The gray-white palette evokes a cloudy sky. 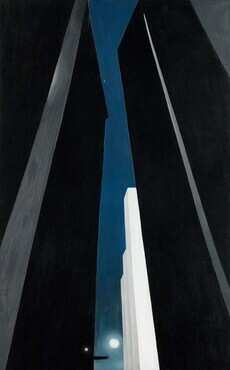 Because of its harsh angularity and monochromatic quality, Charles Eldredge has related Black White and Blue to O’Keeffe’s Manhattan skyscraper subjects. 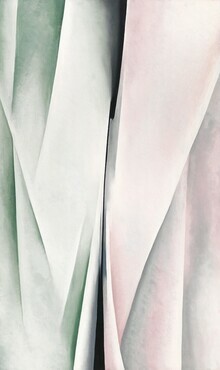 Charles Eldredge, Georgia O’Keeffe (New York, 1991), 95. Bruce Robertson, “Useable Form: O’Keeffe’s Materials, Methods, and Motifs,” in Barbara Haskell, ed., Georgia O’Keeffe: Abstraction (New Haven and London, 2009), 128. Shortly after completing Line and Curve, O’Keeffe painted Black Abstraction (1927, The Metropolitan Museum of Art, New York; Lynes no. 574), a work inspired by her recollection of a vision she had prior to succumbing to anesthesia before an operation. 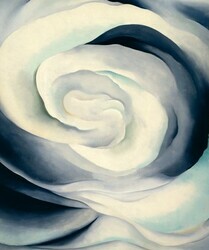 The various associations conjured by O’Keeffe’s paintings from the 1920s—skyscrapers, clouds, crumpled paper, and anesthetic dreams—are reminders of how indebted the Stieglitz group was to the allusive, protosurrealist imagery favored by late 19th-century symbolist poets and painters, such as Stéphane Mallarmé (French, 1842 - 1898) and Odilon Redon (French, 1840 - 1916). Georgia O’Keeffe, Georgia O’Keeffe (New York, 1976), below pl. 62, and opp. pl. 86. O’Keeffe had already articulated identical ideas about abstraction in a letter to an unknown recipient of March 21, 1937, quoted in Charles Eldredge, Georgia O’Keeffe: American and Modern (Fort Worth, TX and Abiquiu, NM, 1993), 171. The artist [1887-1986]; her estate; bequest 1987 to NGA. Georgia O'Keeffe: Paintings--New and Some Old, An American Place, New York, 1933, no. 23, as Abstraction, White, Grey and Violet. Some Marins, Some O'Keeffes, Some Doves, An American Place, New York, 1940, no. 14. Arthur G. Dove, John Marin, Georgia O'Keeffe, Alfred Stieglitz, An American Place, New York, 1941, no. 10. Georgia O'Keeffe: Retrospective Exhibition, Museum of Modern Art, New York, 1946, no. 26. Alfred Stieglitz Exhibition: His Collection, Museum of Modern Art, New York, 1947, no. 79 (circulated to Art Institute of Chicago in 1948; see next citation). Alfred Stieglitz: His Photographs and His Collection, Art Institute of Chicago, 1948. Georgia O'Keeffe: An Exhibition of the Work of the Artist from 1915 to 1966, Amon Carter Museum of Western Art, Fort Worth; Museum of Fine Arts, Houston, March-July 1966, unnumbered catalogue. Georgia O'Keeffe, The Art Museum, The University of New Mexico, Albuquerque, September-October 1966, unnumbered catalogue. Georgia O'Keeffe: Paintings, Museum of Fine Arts, Museum of New Mexico, Santa Fe, 1986-1987, unnumbered catalogue. 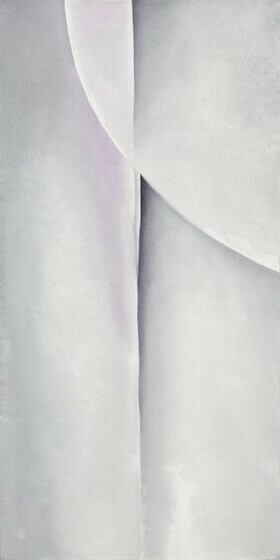 Georgia O'Keeffe: American and Modern, The Hayward Gallery, London; Palacio de Bellas Artes, Mexico City; Yokohama Museum of Art, Japan, 1993-1994, no. 40, repro. Georgia O'Keeffe: Abstraction, Whitney Museum of American Art, New York; The Phillips Collection, Washington, D.C.; Georgia O'Keeffe Museum, Santa Fe, 2009-2010, unnumbered catalogue, pl. 94. Collection Conversations: The Chrysler and the National Gallery, Chrysler Museum of Art, Norfolk, 2015-2016, no catalogue. Georgia O'Keeffe, Tate Modern, London, 2016 - 2017, unnumbered catalogue. Georgia O'Keeffe, Tate Modern, London; Bank Austria Kunstforum, Vienna; Art Gallery of Ontario, Toronto, 2016-2017, unnumbered catalogue, fig. 37 (shown only in London). The unlined plain weave fabric support remains mounted on its original stretcher. All the tacking margins are intact. The artist applied paint directly and thickly over a bright white paint layer that was placed on top of the commercially prepared gray-white ground. There is evidence of a rudimentary pencil underdrawing. The painting is in excellent condition. The surface has not been varnished. American Paintings: An Illustrated Catalogue. National Gallery of Art, Washington, 1992: 249, repro. Lynes, Barbara Buhler. Georgia O'Keeffe: Catalogue Raisonné. 2 vols. New Haven and London, 1999: 1:328, no. 572, color repro. Helen Bullitt Lowry and William Carter Halbert, “The New Architecture and the Old,” New York Times, May 4, 1924. Jennifer Hardin, Georgia O’Keeffe: The Artist in Focus (St. Petersburg, FL, 1998), 8. Bruce Robertson, “Useable Form: O’Keeffe’s Materials, Methods, and Motifs,” in Barbara Haskell, ed., Georgia O’Keeffe: Abstraction (New Haven and London, 2009), 128.